Heat oil in 8-inch nonstick skillet over medium heat. Cook onions in oil 2 minutes; stir in tomato and basil. Cook, stirring occasionally, about 1 minute or until tomato is heated through. Pour egg product over tomato mixture. As mixture begins to set at bottom and side, gently lift cooked portions with spatula so that thin, uncooked portion can flow to bottom. Avoid constant stirring. Cook 3 to 4 minutes or until eggs are thickened throughout but still moist. Sprinkle with pepper. 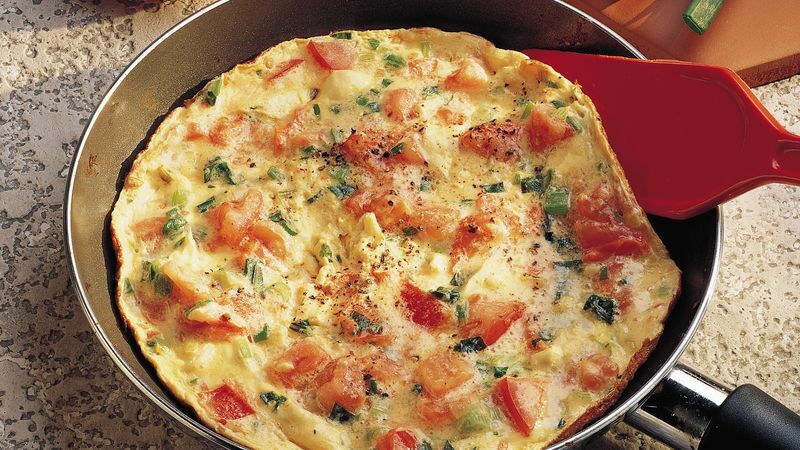 This is a delicious brunch dish for summer, when tomatoes are at their ripest and fresh basil is most fragrant.